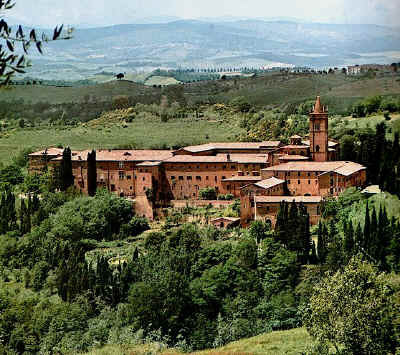 The Abbey of Monte Oliveto Maggiore is located 36 km south of Sienna in the characteristic "badlands" landscape of the Crete Senesi. The Olivetan community traces its foundation to 1313 and Giovanni Tolomei - who took the religious name of Bernardo - along with two of his friends, from the noble families of Sienna, Patrizio Patrizi and Ambrogio Piccolomini. 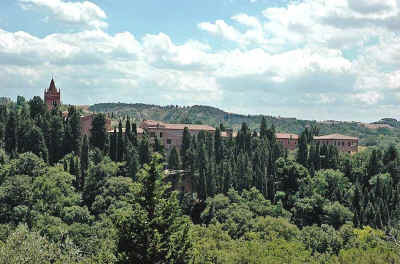 The Abbey is situated 273 m above sea level at Chiusura, not far from Asciano in the province of Sienna, surrounded by the thick forest that overlooks the Crete Senesi countryside below. 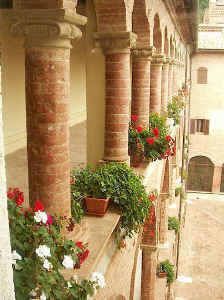 The dispensary of the monastery was active until 1865. 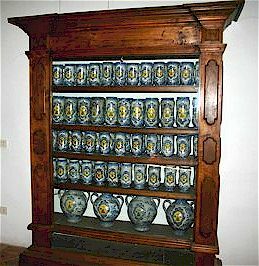 Its rich collection of pharmaceutical jars is housed in the room above the monumental library and consists of 17 C and 18 C ceramics originating from the furnaces of San Quirico d'Orcia. 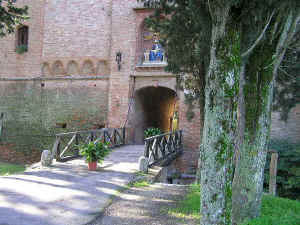 Many visitors come to the Abbey of Monte Oliveto to hear the Gregorian chant sung by the monks. At Monte Oliveto, as in many other Benedictine monasteries, they are part of the conventual mass, at Vespers, at Compline and, in part, at Lauds. 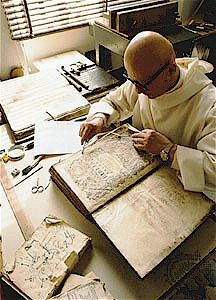 Gregorian chant, which today fascinates believers and non-believers more than ever, evokes the early the Church. Pope Gregory the Great (†604), reordered and codified the liturgical repertory and it is from his name that the appellation "Gregorian" is derived. 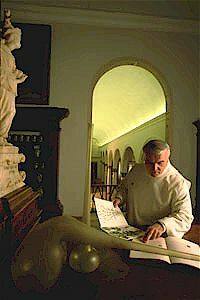 The 8 C to the 13 C was the golden era of the Gregorian and, after a period of partial oblivion and alteration, it was restored to its original purity in the 19 C thanks to the efforts of Abbot Guéranger and his monks at Solesmes in France. 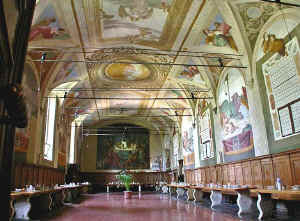 The Second Vatican Council recognised it as «proprio della liturgia romana», recommending it for a principal liturgical position. 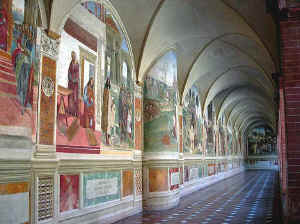 The style of the Gregorian Chant has a unique modality, and this explains its unequalled spirituality which moves believers and non-believers alike. Antoine de Saint-Exupery wrote: «il n'y a qu'un problème, un seul, de par le monde. Rendre aux hommes une signification spirituelle. Des inquiétudes spirituelles. Faire pleuvoir sur eux quelque chose qui ressemble à un chant grégorien». Monte Oliveto © ammonet InfoTech 2006 - 2018. All rights reserved.